Happy Monday! 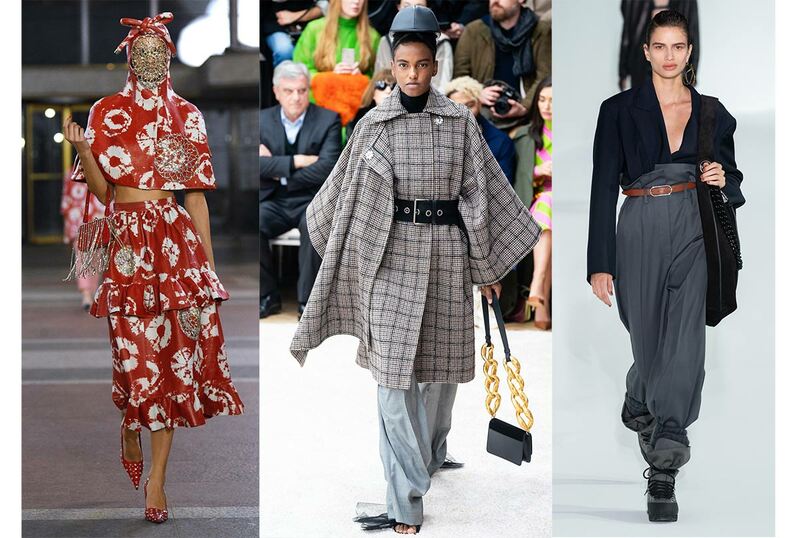 I have been having a lot of fun over the last week reviewing all of the shows from the F/W 2019 season and thinking about some of the trends we’re going to be seeing everywhere come fall. I love to take inspiration from runway looks when I’m thrifting and shopping vintage, and I love to see how the designs of the past come into play each new season. Let’s take a look at some of the top trends we’ll be seeing this year! 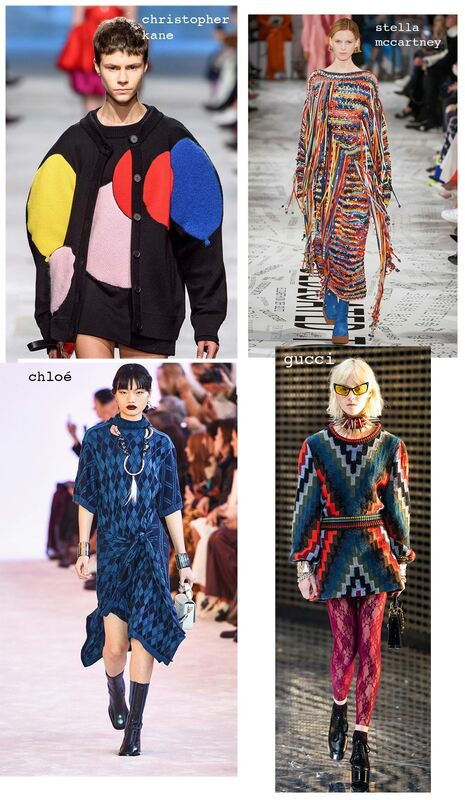 Imaginitive knits were everywhere this season. As a knitwear freak I am deeply excited about this trend. The Christopher Kane balloon cardigan was a look that reached out and touched my soul. I need this! Hello, 90’s revival. 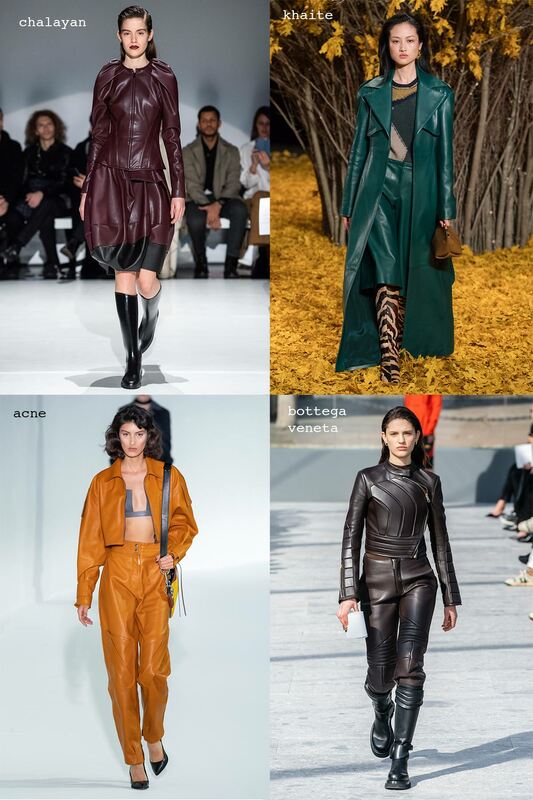 Head to toe leather looks were on so many runways I lost count. In the interest of sustainability (for my wallet and the planet) this is one I will be thrifting, and what an easy look to thrift! The emerald green look from Khaite with the zebra boots is my favorite take on this trend. Genius color choice and love it paired with the patchwork sweater. Finally! I knew jewelry maximalism was going to make it’s way back into fashion eventually. 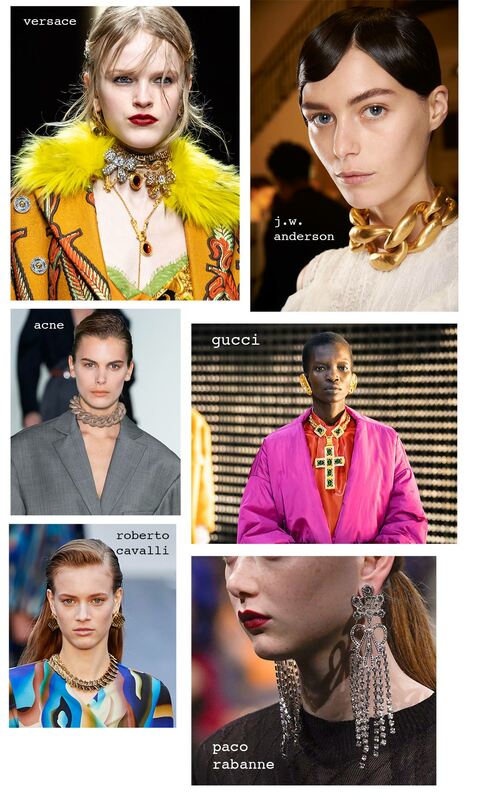 From the super 80s matching choker and business lady earrings at Cavalli to the giant Byzantine crosses at Gucci, this is the time to be snapping up that vintage Lacroix jewelry you’ve always coveted. Go big or go home! This is the trend I am most thrilled to see making a comeback. 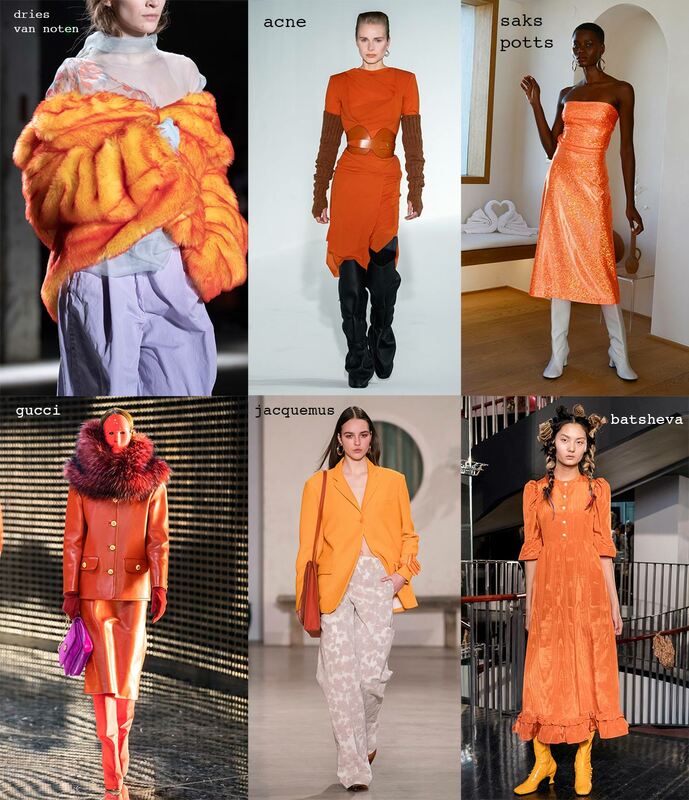 It was impossible not to notice that orange was the color of the season. It was absolutely everywhere, in every form and fabric imaginable. I am particularly enamored of the acid orange faux fur chubby on the runway at Dries Van Noten. I predict the Jacquemus blazer to be the fashion week item of the year. 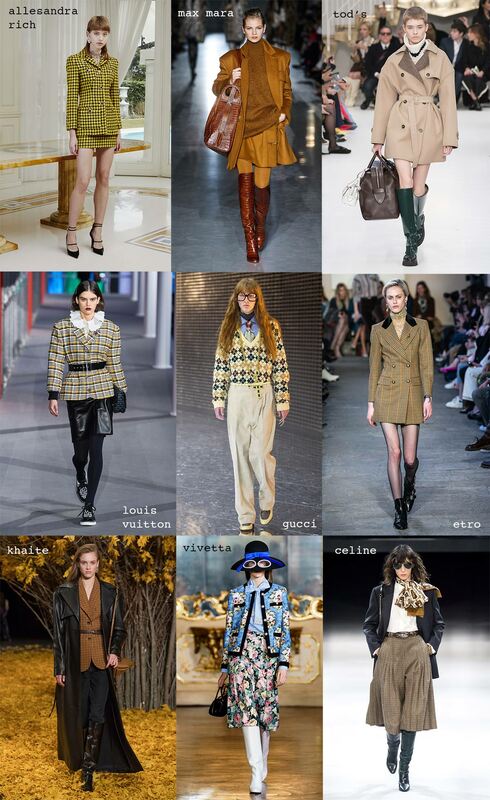 The use of color there this season was very clever. 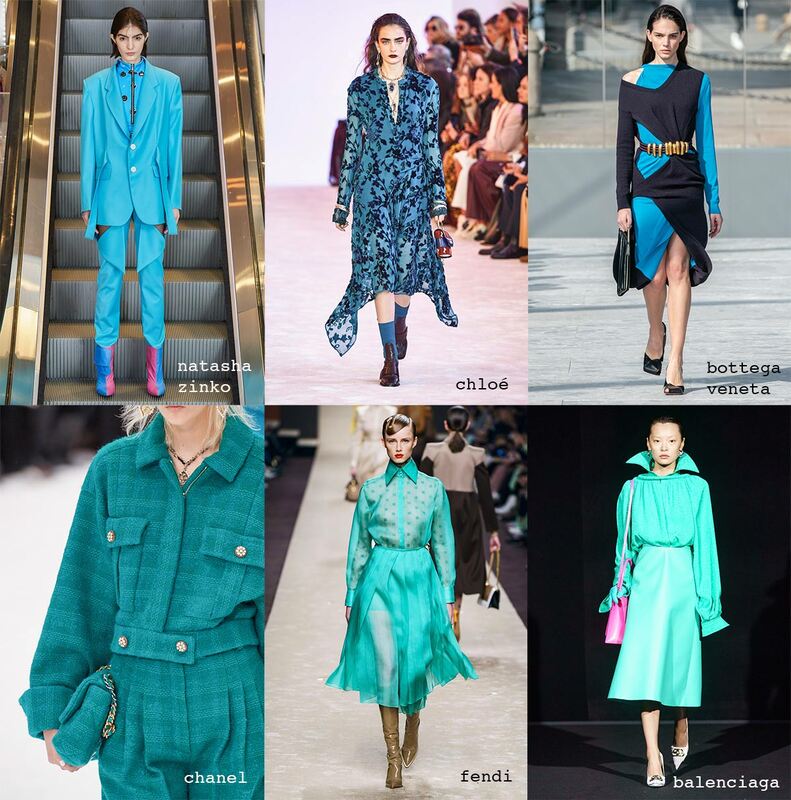 Shades of electric blue-green are going to be everywhere this fall. The stigma of tacky 80s colors is finally gone and I could not be happier. That Bottega dress with the belt is one of my favorite looks of the season. I love this trend. So arts and crafts. I keep a notebook full of things to look out for when I’m shopping and this trend is at the top of my list. 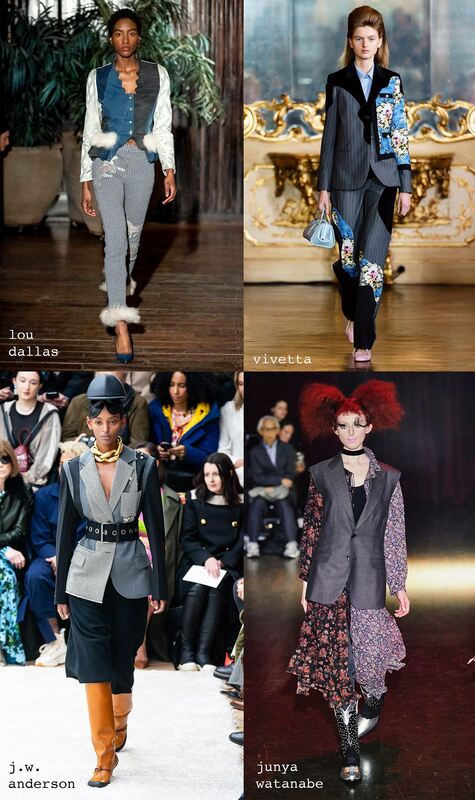 I was extremely excited to see my favorite designer Junya Watanabe go all in on this 80’s look. J.W. Anderson did a great job of making this look really elevated. 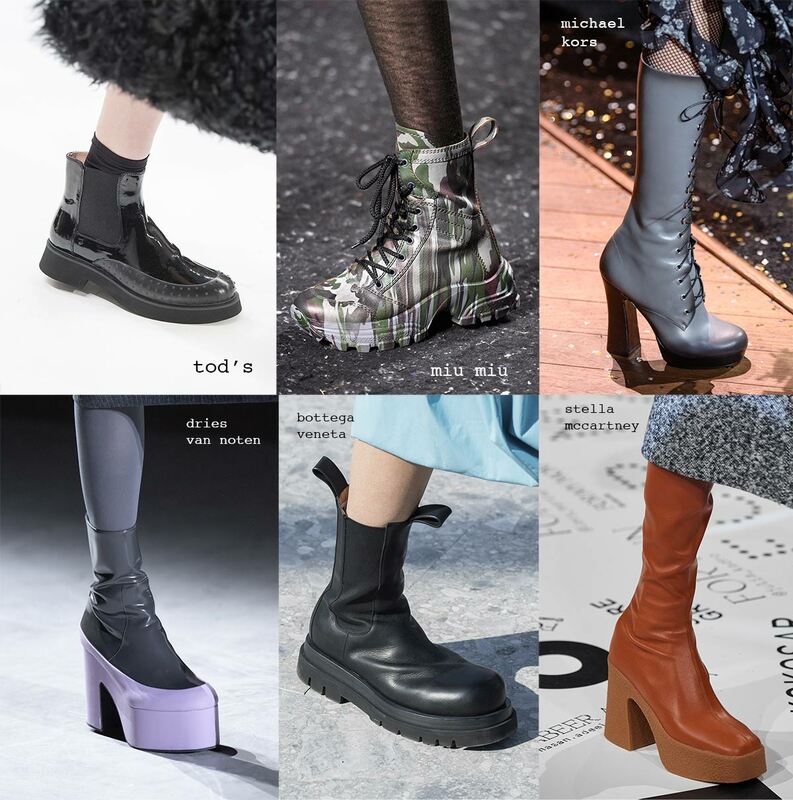 The platform boot trend has been bubbling under the surface for the last few years but I think now we’re really doing it. This will really be the year of the platform boot. There are a lot of hiking boot hybrids (see Miu Miu) and then there are the full on glam rock boots like those seen at Michael Kors. Personally, I’ll take the Stella McCartney boots in a size 39, thank you! Everything is coming up Heathers for fall 2019. I am pretty excited about this trend as it’s good cheeky fun and highly thriftable. Everyone lost their mind for the Celine collection, though I don’t know if it’s revolutionary to just send archival 70s Celine pieces down the runway again, there is no doubt they still look great. 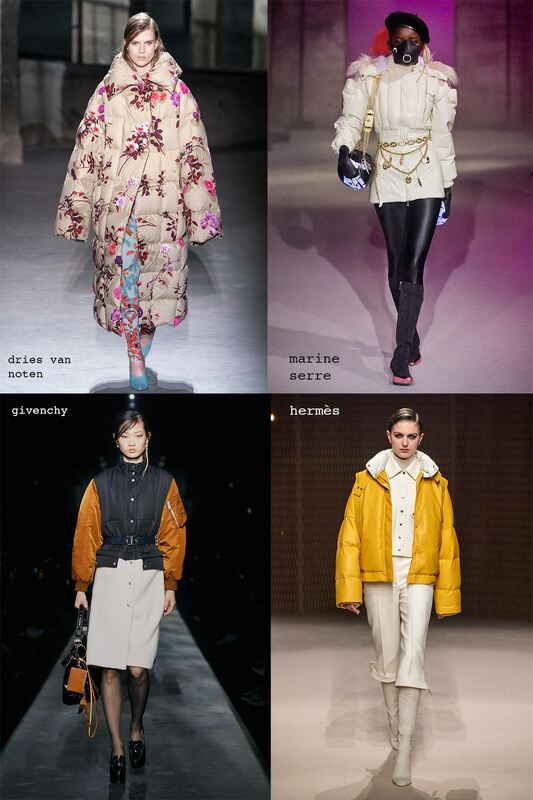 It seemed like there was hardly any show that didn’t have at least one puffer coat look in it! 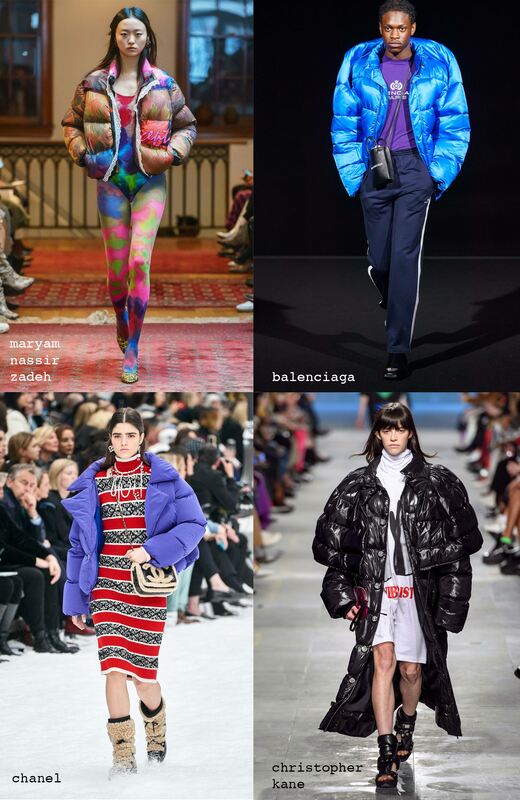 I love seeing puffer coats reach evening wear status like they did at Dries van Noten. It’s nice to see the everyday puffer get an update. I really adore the wasp waist puffers at Marine Serre. Saccharine sweet ironic knits made an appearance on many runways, and again, as a funny sweater collector I could not be more thrilled. 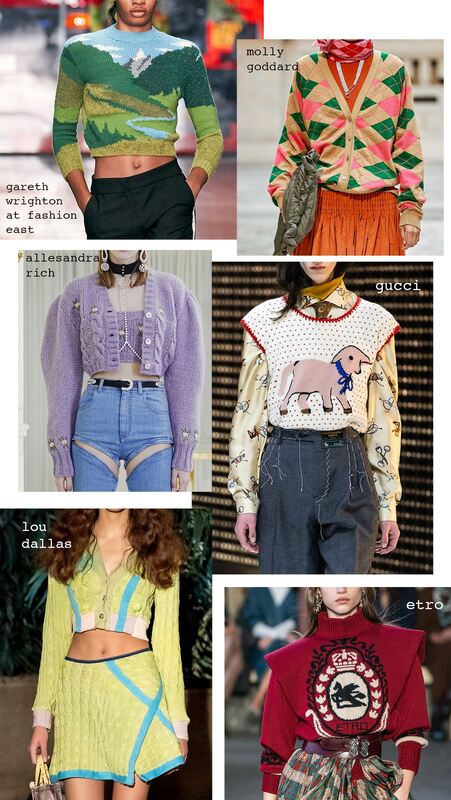 I used to have a 70s sweater very much like the one Gareth Wrighton showed at Fashion East. The argyle pink and green color combination at Molly Goddard was absolutely precious. I hope this list gives you some inspiration for styling and shopping the next few months! I know I am pretty excited to do my F/W shopping after this last fashion week. I might do an IGtv episode about thrifting the runway trends, what do you think? Enjoy the rest of your week everybody! Here for the leather looks and platform shoes. Yes and yes. Yes please to that IG video! Looking forward to your great thrifting advice.